Buy tickets to see your favorite bands play at some of the hottest New York concert venues! Find detailed information about all the great concert venues in New York. Almost all of the legendary top performances that music history can offer were given birth in the Apollo Theater. Surely this one and only preferred concert venue in NY will satisfy your eagerness to gaze at musical legends from the early thirties up to the present. The world famous Apollo Theater is so much more than a historic landmark - it is a source of pride and a symbol of the brilliance of American artistic accomplishment. With its rich history and continued significance, the Apollo Theater, considered the bastion of African-American culture and achievement, is one of the most fascinating chronicles in American history. The legendary Concert venue in NY has launched the careers of icons such as Stevie Wonder, Michael Jackson, James Brown and Lauryn Hill and continues to maintain its position as the nation's most popular arena for emerging and established African-American and Latino performers. What are you waiting for? 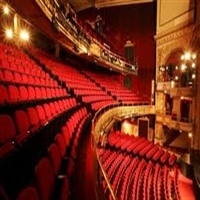 Experience live music at the Apollo Theater as it continues its annual celebration of Broadway.